It has been crazy hot and humid in Connecticut lately and I've pretty much had my fill of it. Relaxing with a tasty, frozen cocktail at the end of a long, sticky day feels great. I don't know about you, but I stink at making frozen drinks and smoothies in my blender. They always come out watery with huge chunks of ice. OK and I'm a little bit lazy too. 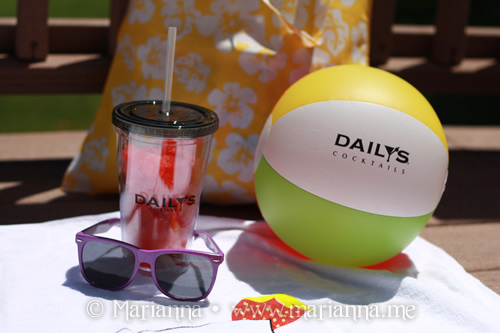 With Daily's Cocktails frozen cocktail pouches, I never have to battle with my blender again. 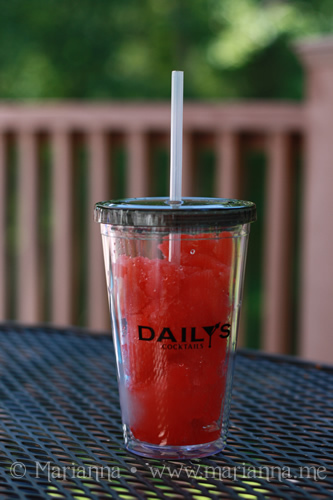 Daily's has 13 cocktail flavors and new for 2013 they added three new tropical flavors - Bahama Mama, Blue Hawaiian and Hurricane; and three new Light flavors - Light Pink Lemonade, Light Margarita and Light Mango Passion Fruit Daiquiri. The Daily's Cocktails rack at my local liqour store was pretty sparse, which goes to show you how popular these are for just $1.99 per pouch. So I grabbed two flavors that I had a feeling I would enjoy: Frozen Lemonade and Strawberry Daiquiri. 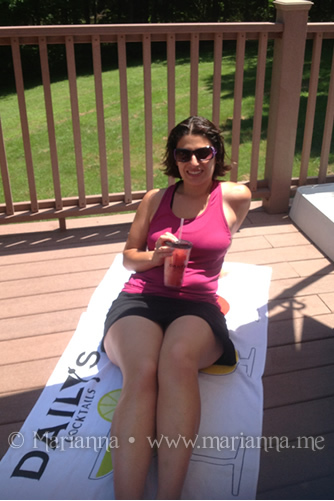 So on a hot afternoon when I was free of kids, I laid back next to our pool and enjoyed a nice frozen cocktail. And by pool I mean the 5 foot in diameter kiddy pool. Hey, when the heat index is 100 and it is so humid you can't breathe, any size pool will do! 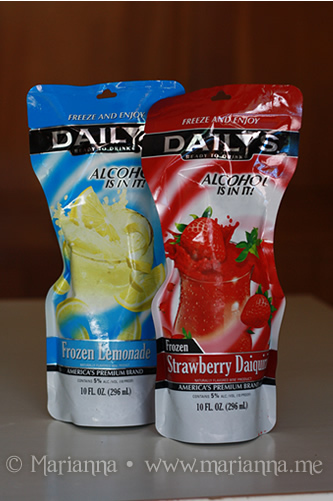 These pouches are 10oz with a 5% alcohol by volume, which isn't too strong for this lady. And the Light pouches have only 180 calories. They were super easy to put together. I set them on the counter for a minute or so just to thaw a bit, you can also run them under cool water, then I cut the pouch open and squeezed it into my cup. Voila! All done and no messy blender to clean up after the party is over. As I predicted, the Frozen Lemonade and Strawberry Daiquiri that I picked out were delicious and just what I needed after a hot week with 4 kids running all over me 24/7. (Is it time for school yet?) I'm hoping I can find the Pina Colada one around here because I would love to give that a try. One (1) reader will receive a Daily's Gift Pack which include a $10 Walmart gift card, Daily's Cocktails beach ball, beach towel, and tumbler, plus a pair of sunglasses and a tropical beach bag. This giveaway is open to U.S. residents, age 21+ only. Giveaway ends on July 27, 2013. Please use the Rafflecopter form below. I was provided with a gift pack for review. All thoughts and opinions are my own. Please drink responsibly. oh Piña Colada..I love it! I'd like to try Blue Hawaiian. I'd love to try the Daily’s Frozen Blue Hawaiian Pouch. I've tried a few other flavors and loved them, and would love to try something NEW! I would like the frozen Magarita. I'd like to try the new hurricane flavor! Would like to try the Light Pink Lemonade. I'd like to try the light pink lemonade! the light mango passionfruit sounds delish! Mango passionfruit sounds amazing. I hope I get to try it. I'd love to try the Pomegranate Acai Margarita. I would like to try their hurricane, yum. I would like to try the light margarita flavor.